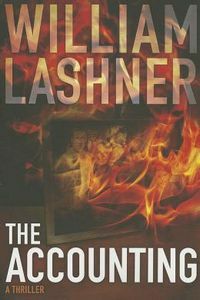 The Accounting by William Lashner, a Mysterious Review. Review: A man's past catches up with him decades later when he's pursued for something he did as a teenager in The Accounting, a stand-alone thriller by William Lashner. In his youth, J. J. Moretti — that isn't the name he was born with, but the name most everyone knows him by — was best friends with two other boys, Augie and Ben. Inseparable, they did everything together … including stealing over $1 million in cash from drug dealers operating out of the house across the street when they were 17 years old. In (what they thought was) a clever twist, they called the police, who arrived to find the dealers and the drugs, but unaware that the money stashed inside was missing. The timing was also fortunate, as each was about to head off to a different college, so they wouldn't be seen together, possibly ever again. Still, they promised to keep in touch on a regular, scheduled basis. Now, many years later, when Augie misses one of their calls, J. J. heads to Las Vegas where he lived, only to find him tortured to death in his home. Assuming — correctly — that someone has pieced together what happened so long ago, J. J. executes a long devised plan to vanish forever, but realizes that he can't escape the past as cleanly as he had planned. Told exclusively from the point of view of J. J. (aka Jon Willing), The Accounting is a nicely crafted thriller, with an intricate storyline that seamlessly interweaves events from the past into what's happening in the present. The intensity of J. J. 's anxiety about how he's going to stay one step ahead of his pursuers is a strongly developed psychological element here. There aren't a lot of surprises along the way and yet it isn't totally predictable either. The author is really quite effective with his storytelling, creating an unusual mix of certainty and uncertainty, both in terms of character and situation. Two relatively minor quibbles: it is, to be sure, a long book, with many passages that clearly could have been, indeed should have been edited to be a little more concise; which contributes to the second issue that there's rather too much heavy-handed moralizing about the recent (and, for many, current) financial crisis, starting with the (admittedly aptly worded) title. Eliminating the second problem would have in large part taken care of the first, elevating an already very good thriller into a first-rate one. Acknowledgment: Thomas & Mercer provided an ARC of The Accounting for this review.